Fasten your seatbelts for an unforgettable time in East Boston. Join us for a truly local experience as you discover what’s going on over on the other side of the harbor. Your tour begins at the Aquarium “T” Station on Boston Harbor’s Long Wharf. Take in views across the harbor at East Boston before we head underground to the Blue Line T Station. Your guide will help you navigate the modern system as you get on the train and travel under the Harbor through the oldest subway tunnel in the country, (in fact, it’s the third oldest in the world, dating all the way back to 1904!). If time allows, we will get out at the Maverick T Station to tell you more about the subway project. Back on the train, we’ll travel just one more stop to the Airport T Station. Enjoy the local scene at Bremen Street Park, and your guide will lead you through the park and into the heart of East Boston. As we walk, you’ll see shops and restaurants reflecting the diversity of the East Boston residents. You can travel around the world in East Boston without ever having to leave the neighborhood! Next, it’s time for bowling Boston-style, with candle-pin bowling. 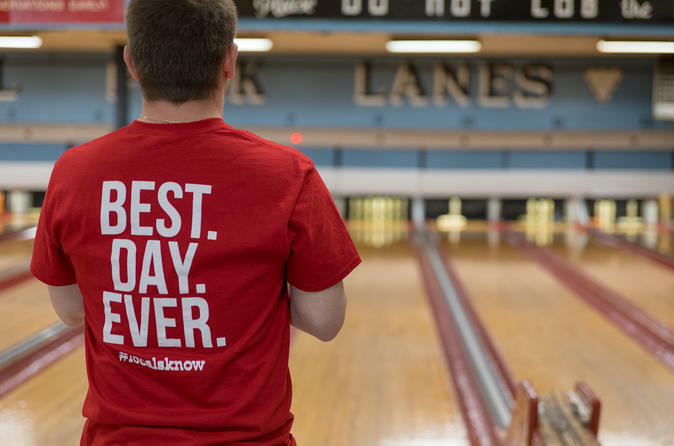 Before hitting the lanes, you’ll have the option to pick up a beverage to bring over to this classic neighborhood bowling alley which encourages you to BYOB. Built in 1950, this bowling alley hasn’t changed much, with manual scoring, gravity-powered ball return and wood paneling completing the retro atmosphere. After bowling a few frames, you’ll come to love this New England pastime. If bowling isn’t available, we’ll make our way over to one of the neighborhood billiards halls where we’ll have a chance to play a game of pool together. When you grab a beer, enjoy the music and chat with the locals at the pool table, to really get a feel for what this neighborhood is all about. The evening continues as you walk down Meridian Street, taking in some murals depicting the history and influence of immigration in East Boston. We will continue to Maverick Square, where we will enjoy a snack or two along the way. You’ll discover the best variety of food in all of Boston concentrated in this area, from Colombian bakeries, to Italian sandwich shops, Mexican taquerias, El Salvadorian cafes and Chinese restaurants, the choices are endless! Your tour concludes at the heart of East Boston - Maverick Square. Ask your guide for the best dinner recommendations and continue the fun or make your way back to Downtown with the feeling that you’ve experienced Boston at its realest.